Suicide is now the United States’ 10th leading cause of death. It is also one of only three causes of death in the US that are increasing (Alzheimer’s disease and drug overdose are the other two). This data supplied by the Centers for Disease Control and Prevention and reported by the Los Angeles Times and the Omaha World-Herald, reflect the decay taking place in American society and culture, yet an increasingly dishonest media culture refuses to seriously acknowledge that this indeed is a problem. The food writer revealed he had contemplated suicide several times. “There have been times, honestly, in my life that I figured, ‘I’ve had a good run — why not just do this stupid thing, this selfish thing… jump off a cliff into water of indeterminate depth,'” Bourdain told the magazine. Bourdain told People in February he felt “some responsibility” to “at least try to live” after welcoming daughter, Ariane, now 11, with ex-wife Ottavia Busia in 2007. Mr. Bourdain is presently being remembered in a very loving way, and this is in all fairness. But his suicide and that of fashion designer Kate Spade, who hanged herself while her daughter was at school a few days before, are not anomalous as they ought to be. The suicide rate in the United States has rocketed up in recent years. Between 1999 and 2016, the CDC reports that suicide rates increased in almost every US state, and that in 25 of them, that rate rose more than 30 percent during this time. More disturbing, 54 percent of those who took their own lives did not have a known diagnosed mental health condition. The Christian understanding of the sanctity of life comes into this matter very strongly. While the news often highlights this catchphrase in issues regarding abortion, the matter has become very muted in regards to suicide. A gradually more prevalent viewpoint in Europe and the West is that the end of one’s own life is one’s own business. Euthanasia (dubbed “mercy killing”) is legal as such in only three countries worldwide (The Netherlands, Belgium and Luxembourg). But variants that all lead to the same thing have taken hold in many Western countries. 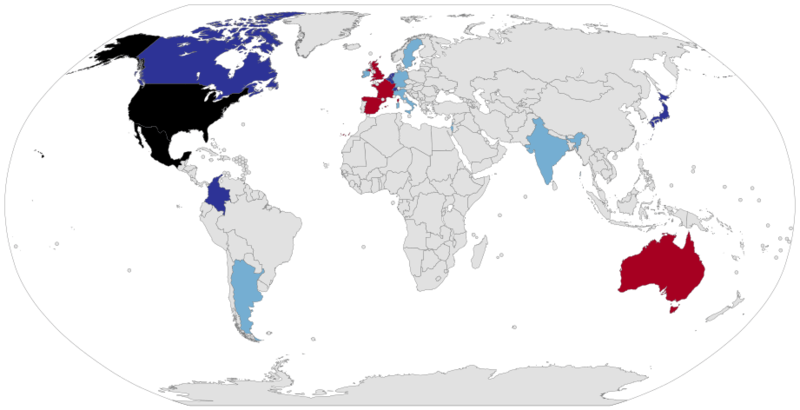 The nations in black have a vague legal situation about euthanasia in any regard. The green ones allow passive euthanasia, and the yellow ones blatantly allow assisted suicide. While these maps concern the medical and sanctioned practice of assisted suicide, the trend is concurrent with the rise in personally decided suicide as well. In 27 US states the suicides were found to have happened after relationship loss or problems; drug use, physical health problems or problems in the spheres of work, money, housing or legal stress. “Our data suggests suicide is more than a mental health issue,” said Deborah M. Stone, lead author of that study. Noting that suicide is “very rare” among those with chronic depression, Stone said friends, families and co-workers should not overlook the risk of self-harm among people who have never been diagnosed with mental illness. Ms. Stone is correct. This is indeed more than a mental health issue. Something has happened internally with many people that has led them to believe that life is not worth keeping, and that suicide is indeed a more painless escape from problems. This decay can be connected with the decline of traditional values, most notably those found in Christianity, in all of these locales. Christianity points out the basic truth that only God creates life, and because life is something only God can make, it is simply not our place to take it away. Thus for thousands of years, the taking of one’s own life was extremely rare, usually the province of the severely depressed or the heroes who gave their lives for the sake of others. But Mr. Bourdain expressed a different attitude entirely in regards to his own life. The man had experienced great success in life, but was unreserved in his even expressing his thoughts of committing this radically selfish act, even despite the fact that years before he claimed that his daughter’s existence gave him a reason to live. It should also be noted that Mr. Bourdain was a heavy drug user earlier in life, using a lot of heroin, and that also even up to the point of his death he continued drinking heavily. What is this supposed to tell these kids? As in these cases, it seems to have become increasingly permissible to take the one gift that no one in this world can possibly give – life itself – and abuse it or throw it away. Cultures that are in a state of disintegration, such as the Roman Empire before the end, or the Russian Empire before Communism, or the American empire now, passed into and through this disintegration after a period of fancied self-sufficiency, where the traditional value on life, family, God and nation were rejected for the sake of esoteric living, mind-bending philosophy, and most of all, lack of restraint in living. For those in the American nation this assertion may appear strange, as the great number of churches, many of whom are growing, would suggest that Christianity is real, alive and growing by great leaps and bounds. So, how can it be that there is a tie between suicide and an alleged rejection of Christianity? Indeed some who have committed suicide are faithful church members. The answer to this question cannot possibly be a one-size-fits-all notion. The matter is complex. However, one rather unique quality of American life is a very rugged sense of individualism. Even for the American Christian, the emphasis has long been placed culturally that “you take care of yourself, because no one will do it for you.” And this along with the flip side of this, expressed as something like “I am free and I can do whatever I want, and I am right because God is on my side” creates a problem. Such people will not likely ask for help when times are bad. One’s own pride and individualism conspire to shut the door on seeking help, and the concurrent selfishness of those around him or her, seen as “respect” for the right of that person to be left alone, makes sure that the sufferer is indeed completely alone. And one cannot fight the forces of evil, and anti-life, alone. Christianity has never succeeded except in community, and people that try to go it alone in Christian practice often end up insane. The nations that have ancient Christian cultures, as in Russia or Lebanon or Syria, tend to emphasize community and collective good, and they do it so naturally that it would seem absurd to suggest going it alone in life. It is exceedingly rare that a group of people will commit suicide together. And it is even more rare that a community of people, especially Christians, who know that one of their own is thinking about doing this, would let them. The only way that happens now is among groups of people who may at best claim to be Christians, but at the same time they refuse to acknowledge and adhere to the teachings of the Church from ancient times. The Marquis de Sade’s libertine philosophy helped destroy Christian belief in France. That same philosophy of life runs rampant in Europe and the result is clear: dying churches, lowering birth rate, increasing death rates, and the replacement of the European people by an inrush of Muslim immigrants, who actually value their own lives and faith a great deal more. To a slower extent this is happening in America, but as we see from the statistics given, the United States is catching up to Europe very quickly. A return and revitalization of traditional values stands as the clearest and best course of treatment for this problem. He trod on some highly sensitive feet and was “suicided” as post people that came anywhere near the Clintons, the Shin Bet or the Mossad ! Washington needs to solve its own internal problems at home and stop meddling in other countries’ affairs.